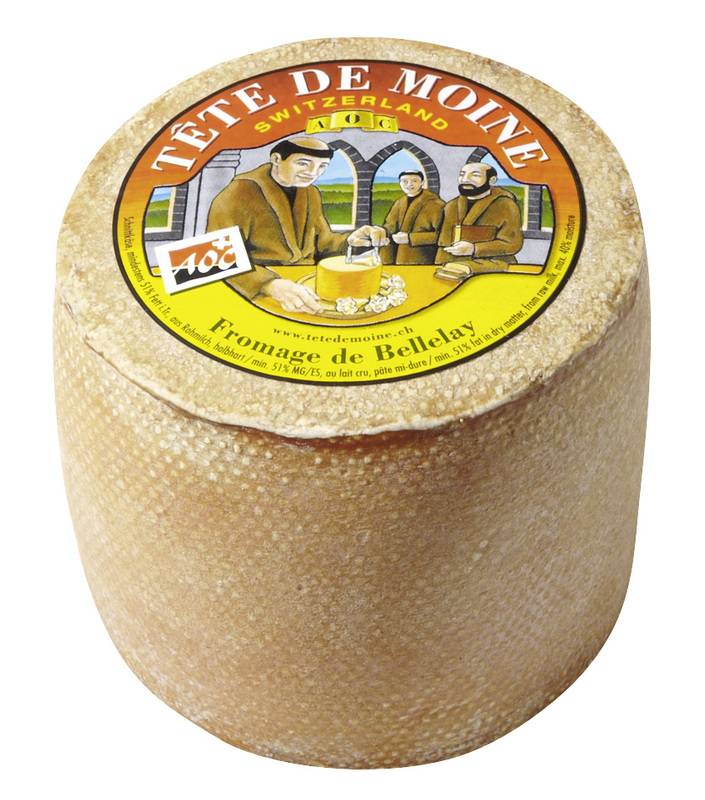 Tête de Moine translates literally as “Monk’s Head”. The cheese contains raw cow’s milk with a half cooked, half pressed paste. 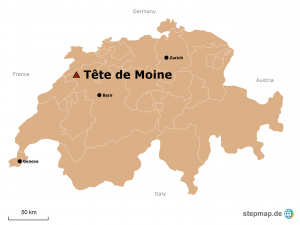 The Tête de Moine was invented and initially produced more than eight centuries ago by the monks of the abbey of Bellelay, located in the community of Saicourt, district of Moutier, in the mountainous zone of the Bernese Jura, the French-speaking area of the Canton of Bern. Traditionally, the cheese is prepared for eating in an unusual way: the cheese loaf is carefully scraped with a knife to produce thin shavings, which is said to help develop scented flavours by allowing oxygen to reach more of the surface. Tête de Moine, literally as “Monk’s Head”. The name was first documented in the records of Mont-Terrible, a Department established by the French when they annexed the region from 1793 to 1799 at the time of the French Revolution. Writings from 1292 attest that the cheese of the abbots of Bellelay had acquired such a reputation that it was used to pay the royalties of the stockbreeders to the farms’ owners, to regulate litigations, being offered as presents to the prince-bishops of Basel, or even as currency. The cheese contains cow milk vintage and entirety, i.e., a cheese with half-cooked or half-hard pressed paste. Its average weight is 850 g. It is characterized by a cylindrical form and is excellent with dry white wine, after being matured for a minimum of 2½ months on small spruce plank. Check out Tête de Moine or The Girolle cheese sharper in our online shop, based in Brisbane Australia! Hi I want to buy the Girolle cheese cutter. I need it next week, happy to pay online but is the a way to pick it up in Sydney? I live in Sydney. I just wanted to get a price on the ‘Tête de Moine’ and a delivery time frame. I have just ordered a Monk’s Head cheese and the Girolle cover, to be sent to the Dunsborough Post Office with a request that they ring the receiver when it arrives. Checking that this is an acceptable way forward ? Hi. Just wondering how long the cheese can keep for once put on the curling device? Also, what’s the best way the curl the cheese, should I take the cheese out and have it at room temperature first? Hi Lily, Thanks for your question. We recommend to use the cheese within a few days once put on the Girolle cutting device. However, it depends on how you wrap and store it. If you remove the cheese from the Girolle and wrap it in cling film or cheese paper it will last much longer. For using on the device, in Australia we recommend to use it straight from the fridge as generally room temperatures are quite high so that the cheese cuts warm up very quickly. If too warm, they will crumble.